Made from polyester webbing with a reinforced tie-in point and stitching, this harness will last even under high use conditions like a climbing gym or ropes course. Metal parts are made of forged steel, outer anodized. Safety and strong ! To ensure safety, please check the buckle when wearing. Every time before use must check clearly. If damage is found, please stop using it. Seat belts should be used in conjunction with the connecting ring to ensure that the body swing collision. Wash in warm water below 50 ℃ to clean, and then allow to dry naturally. Store the safety harness in a dry, well ventilated place, and avoid contact with the heat source. Do not store in a damp location. Climbing is dangerous. You are responsible for your own actions and decisions. We recommend every climber seek qualified instruction. Please have all equipment safety checked by a qualified professional prior to use. Safety certification: CE1019. Weight limited : 500 KG. Maximum Breaking Strength: 24KN. Made from polyester webbing with a reinforced tie-in point and stitching. Front center belay loop is made from a high-strength stainless steel alloy. Unique design: Perfect frame construction guarantees excellent weight. Flexible equipment loops stay out of the way while wearing a pack. All the connections and webbing are very sturdy with reinforced ends. Double back buckle allows quick and easy adjustment of the waist belt. Designed for comfort: Adjustable leg loops allow size to be adjusted depending on comfort desired or layers of clothing worn. 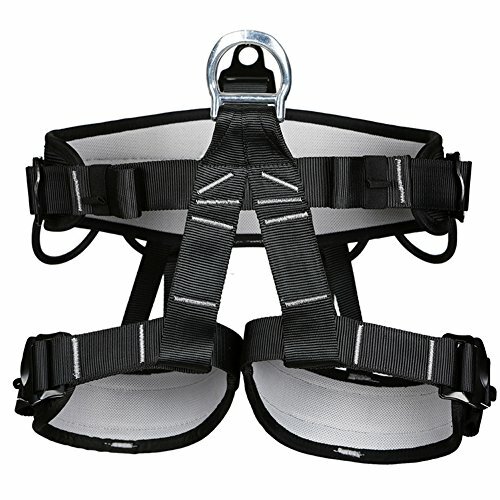 Wider waist belt and leg loops with double straps to keep you comfortable while climbing. Multipurpose: Professional climbing harness for mountaineering, outward band, fire rescue, rock-climber, tree climbing, rappelling,working aloft...They fit well on all ages. If you have any questions about this product by Yougeyu, contact us by completing and submitting the form below. If you are looking for a specif part number, please include it with your message.